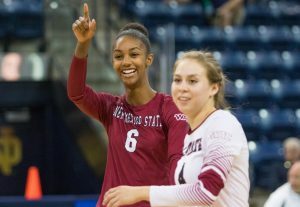 LAS CRUCES, NM – The New Mexico State Aggies and the New Mexico Lobos have been playing volleyball against each other since 1974. On Monday, they played against each other for the 75th time, with the Aggies sweeping the Lobos in three sets. New Mexico State won the first set 25–18, the second set 25–16, and the third set 28–26 to clinch the match victory. Junior outside hitter Tatyana Battle led the way for the Aggies with 19 kills. The Aggies are now 45–30 against the Lobos all-time, and improved their record to 14–7. The victory also marked the Aggies’ 10th-straight win at the Pan American Center. Battle was born and raised in Albuquerque. She graduated from Cibola High School in 2015, and was even recruited by UNM. For her, this match always means a little bit more than the others do. “This game is personal for me because I’m from Albuquerque, so I always want to get a win over [the Lobos],” Battle said. Last year, the Lobos beat the Aggies in four sets, and in 2015 the Aggies won in four. Battle says that it’s always nice for the Aggies to get back at any team who beat them the previous year. Mike Jordan is in his 20th season as the head volleyball coach at New Mexico State, and is a man who knows how to beat the Lobos. With Monday’s win, Jordan is now 17–6 against UNM. Under Jordan, the Aggies went on a 10-game win streak against the Lobos that spanned from 2003–2008, back when the rivals used to play each other twice a year as opposed to just once like they do now. Jordan spoke on how much UNM has improved since Jeff Nelson took over as head coach in 2011, and how competitive the rivalry has been since then. “It’s been a good one since Jeff took over up there,” Jordan said. “It’s been very competitive. We were dominating it for a long time, and he’s done a good job of making them competitive and always tough to play. So, it’s a special rivalry. UNM always has a good program. They’re never bad or mediocre. They’re always pretty good to great, so sweeping them tonight was nice,” he added. Like Battle, Coach Jordan agrees that beating a team who he lost to last year is very satisfying. The Aggies’ next match will be at home Saturday against UT-Rio Grande Valley, who beat the Aggies to open conference play back on Sept. 23 in Edinburg, Texas. Saturday’s match will be a battle for first place in the WAC, as the Vaqueros (12–8, 6–1), are just ahead of the Aggies (14–7, 5–2) in the WAC standings. Battle said she knows the match on Saturday will be a tough one, and that her team will have to be well-prepared leading up to it, and that Monday’s win was a head start in terms of preparation. Saturday’s match begins at 11 a.m. at the Pan American Center in Las Cruces.